Have you noticed that your iPhone 7 screen is turning on automatically when you lift it off a table, or when you raise the device higher so that you can use it? 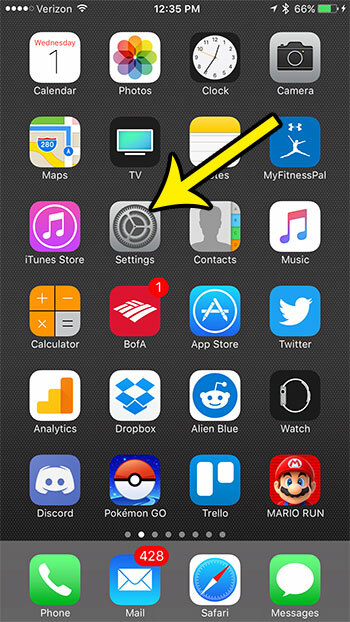 This feature is called Raise to Wake, and is meant to make the iPhone a little easier to use. However, you might decide that you want to disable Raise to Wake on your iPhone if this setting is negatively impacting the way you use the device. Our guide below will show you how to disable Raise to Wake on an iPhone. This setting will adjust the functionality of your iPhone’s wake feature so that the screen will only light up when you press one of the buttons on the phone. Choose the Display & Brightness option. Tap the button to the right of Raise to Wake to turn it on or off. For additional information, including pictures for each step, continue to the section below. The steps in this article were performed on an iPhone 7 Plus in iOS 10.2. 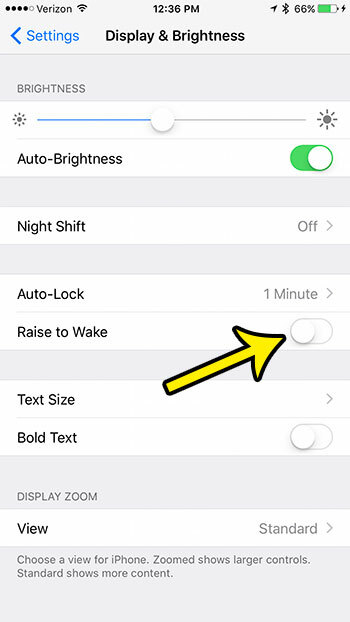 These steps are going to show you how to find and disable the Raise to Wake setting on your iPhone. This is the setting that causes your screen to turn on when you life the phone. By turning off the Raise to Wake feature this will no longer happen, and you will need to press the Home button or the Power button to turn on the screen when it is locked. Step 2: Select the Display & Brightness menu. Step 3: Tap the button to the right of Raise to Wake to turn it off. The setting is disabled when there is no green shading around the button, and the button is in the left position. Raise to Wake is disabled on the iPhone in the image below. Have you noticed that sometimes the battery icon at the top-right corner of your screen is a different color? 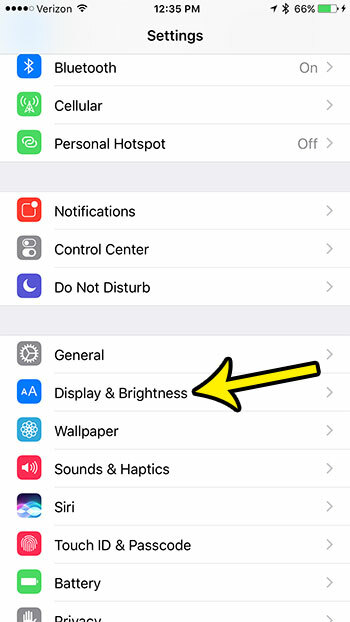 Learn why your iPhone battery icon is yellow, and see what that change entails, and how you can selectively enable or disable that option.